Living in one of the first planned cities in the United States, the goal was to help SCAD and the City of Savannah accomplish a level of understanding within students that would reduce biking accidents and raise awareness. Working with representatives from the city and the school, we provided strategic plans and a progressive implementation strategy to improve biking behavior and build the relationship between bikers, pedestrians and cars. *SCAD Secession Award 14' for Best in Service Design. 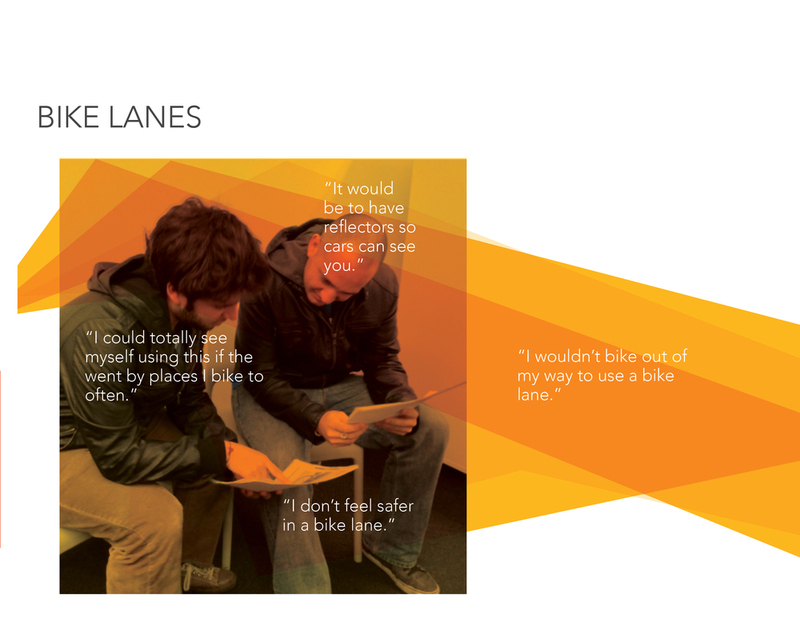 Focusing on establishing a new perspective on how to solve current biking issues from the root, we blended a mixture of creative thinking strategies with a strong focus on desktop and user research. By showing both SCAD and the City of Savannah how the community feels and reacts to biking, allowed them to understand the necessity of changing the mood surrounding biking laws and therefore biking behavior. By educating and presenting a positive culture that can co-exist, we engaged as many different obstacles into an effective idea of how to improve the biking experience. 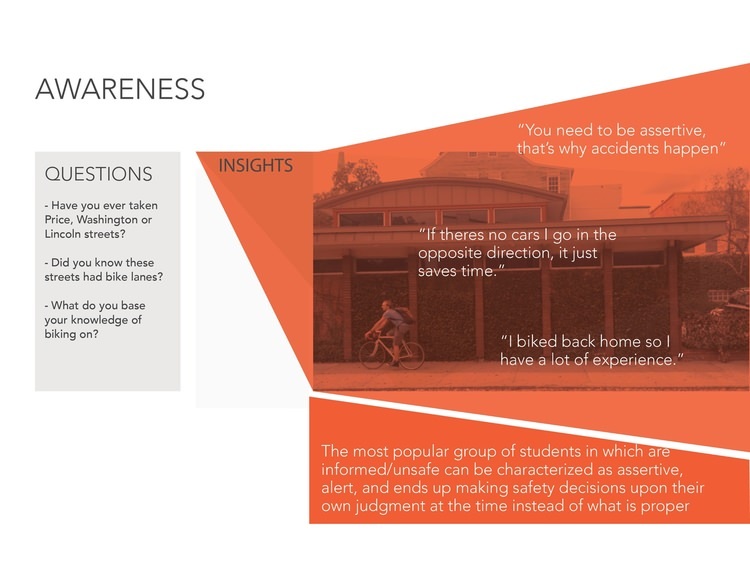 Initial observations allowed us to understand what students were currently doing, guiding our focus areas into: What students know, how they regularly bike, how safe they are and how accessible are resources. 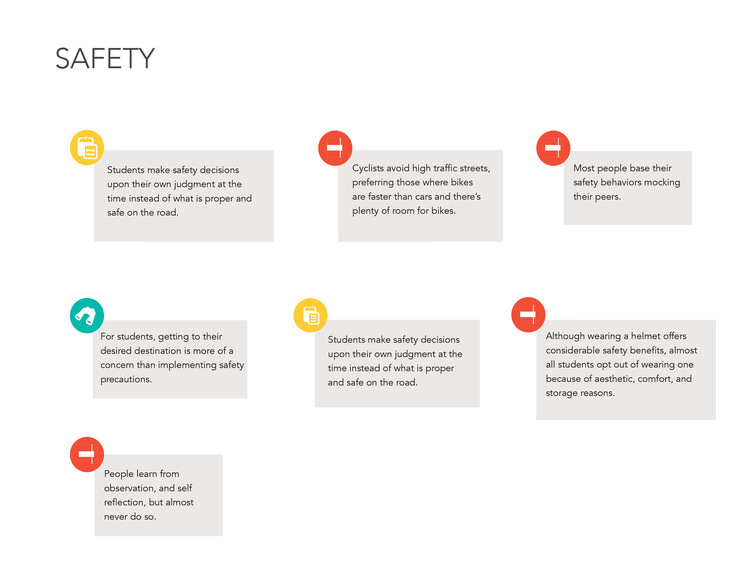 Initial observations allowed us to understand what students were currently doing, guiding our focus areas into: What students know, how the regularly bike, how safe they are and how accessible are resources. We sought out to gather information through diary studies, video testimonials and both active and passive observations which allowed us to better understand how students behaviors changed according to different situations. We realized that two prominent personas made up most of the SCAD population. "Informed Unsafe" bikers like Max, and "Uninformed Unsafe" bikers like Claire. By changing the behavior of these two students, SCAD’s efforts would envelop all of the community. We then reframed the problem into two questions: How do we encourage daredevils to respect and adhere to the rules for their own safety as well as others? How do we encourage newcomers to learn and follow the rules? Affinitizing all the information, all of the data dictated three main themes that were considered to cause the greatest impact. Our goal was not only to evoke change in the student body, but to develop a tighter relationship with locals as well. Bike kit: Our research showed that incoming students such as Claire, are more likely to order bike gear if SCAD offered a bundle of products with a discount during orientation week. 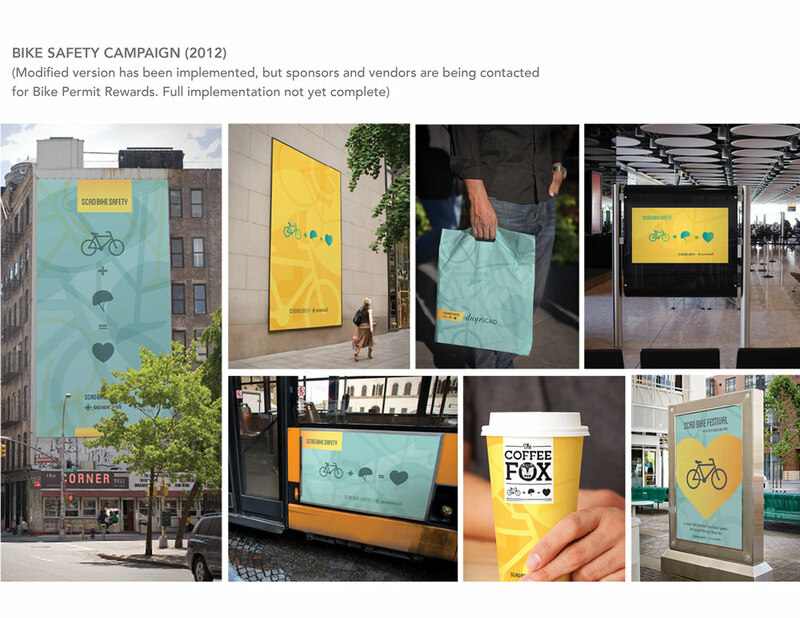 We designed a Bike Kit order system where students can buy a bike lock, lights, helmets and bags. Once they bought the supplies the products would be delivered to their rooms before their arrival. This initiative would increase a change in behavior and reduce the possibility of students not having the necessary supplies to be safe. Bike Permit / Rewards : To teach students how to conduct proper maintenance and remember the rules of biking in Savannah, we developed the Bike Permit. After conducting a workshop, the permit gives students discounts in local bike shops and other food stores, supporting a local initiative, while advocating a safer bike culture. Bike Suitability Map: After surveying every street in Savannah, checking for traffic density, pavement preservation, and biking space we designed the Bike Suitability Map. Equipped with a safe alternative to and from any building in the city, the map serves as the perfect companion to guide incoming as well as existing students. To improve our concepts and refine them into desirable and feasible solutions, we went back to the student body and the community asking for feedback and their thoughts on the possibility of these existing. This part in the process was also key to show our stakeholders, because it was a sure way for them to step down into the customers perspective and hear first hand what the reactions would be. This was something we discovered is rarely done when implementing large plans, and a situation we hoped to begin to mend and give more importance by presenting and validating our process. After user testing our concepts and further refinement, we presented SCAD and the city, an implementation strategy of how we saw biking culture changing through a combination of high and low impact ideas. The importance of dealing with an issue that had so many factors that affected it, was to begin with a visual change, and slowly support such services with larger more profound approaches. Our research and concepts, along with many other hardworking individual and collaborative organizations from the community, helped instill an urgency in addressing this issue, for which positive results have begun to take shape. Savannah was designed to be enjoyed by all. Featuring a breathtaking array of parks and public squares, this beautiful city caters to both pedestrians and motorists and promotes a brilliant concept of urbanism. Looking into the future, hopefully these efforts will continue to grow, into a city so connected to its people that biking is fully integrated into being the most effective form of transportation. Such an evolution, will hopefully promote a healthier lifestyle and an incredibly unique and rewarding experience to everyone who lives there. A special thanks to Savannah City Council and our mentor Robert Bau.